Part of the spirit of Razorback football is the singing of the Alma Mater. In the class of 1906, and just east of the steps of Old Main, you will find the name of Brody Payne. What has become known as the Alma Mater, was penned by Payne as a tribute to the University as he was moved and inspired by the early morning sunrise shining off of the towers of Old Main. As one of the true heroes of the University, his name is often overlooked as people step over it each day without adding anymore significance to it than any of the other thousands carved into the sidewalks. Music for the song was provided by Henry Tovey who was the director of the Glee Club at the time. Tovey is also known for providing the music for the Arkansas Field Song (commonly known as the Arkansas Fight Song) in 1918. As a result, both of the most famous songs associated with the University were set to music by the same person. In 1909, Payne submitted the song to a competition chartered to find a song that was representative of the University. By the end of the competition, he had won first place giving the University its new Alma Mater.The song has gone on to become recognized as one of the top 25 college songs in America. ​The first verse is what has become the common portion that is sung at football games, but below is the complete version as penned by Payne. Far from the land where their footsteps have trod. Mother of Mothers, we sing unto you. Honor to God and the Springtime of Youth. Mother of Mothers, we kneel unto you. Beckon us on like a piloting Star. Mother of Mothers, we pray unto you." The words for Arkansas Fight (known originally as the Field Song) were written by William Edwin Douglas in the class of 1913, and are shown below. His name can be found just east of Brady Payne's on the sidewalk in front of Old Main. On your next visit to the University, make a side trip to Old Main and pay homage to these two people for what they have meant to Hog fans everywhere. ​However, the song is now owned by The Southern Music Company in San Antonio, Texas. (it's ironic that a Texas company would own the license to one of the most famous University of Arkansas songs.) The beginning words are the ones which I chose for my ebook about all of the things associated with the history of Razorback football. The words "Hit That Line" say it all! "Hit that line! Hit that line! Give a cheer. Rah! Rah! All razorback fans can appreciate these three individuals and their contributions which have provided some of the most cherished traditions associated with the University and its athletic programs. Whatever you do, always remember to - Keep the history alive! With the introduction of the movie "Greater" it's only fitting that this month's hawg-tales replay the blog regarding Brandon Burlsworth. Below is this reissue of the true Greater and Hog hero. ​On a lonely stretch of highway U.S. 412E, a white 1993 Subaru was making the all too familiar trip from Fayetteville eastward to the small town of Harrison. The winding road had been one that both the Subaru and its driver knew by heart from having made it hundreds of times during the previous five years. All of a sudden as dusk was approaching, the silence of the farms was shattered by the sound of squealing rubber and crashing metal echoing across the countryside and mountains. The Subaru had collided head-on with an 18-wheeler and was now being hurled back 168 feet before finally coming to its rest. There was no hope for the driver of the small car as he was killed instantly while making the journey home on Wednesday, April 28, 1999, to have supper and go to church with his mother. Being only fifteen miles from his destination, he had nearly made it. But in that instant, he had finally reached his Home. 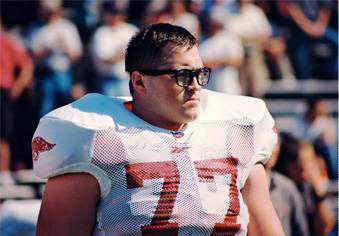 He was only 22 and his name was Brandon Burlsworth 6'4", 308 lbs., All-American Razorback offensive right guard #77. In that same moment, the boy who had been a walk-on for Danny Ford, then a Razorback starting offensive lineman, had gone on to be an All-American under Houston Nutt, and finally a NFL Indianapolis Colts football rookie, now became a true Razorback football legend for Hog fans everywhere. There have only been two numbers retired for Razorback football. The first was the #12 for Clyde "Smackover" Scott. It was then reactivated for Steve Little and finally permanently retired after Little's graduation. However, in a ceremony held in Little Rock's War Memorial Stadium on November 20, 1999, Brandon's #77 was officially retired as only the second number to be bestowed with this honor. Described by defensive lineman Sacha Lancaster as "If God ever made the perfect person, it was that guy." A point brought home by a poster displaying "The Ultimate Razorback". On it, each part of the Razorback football player's anatomy is represented by a former player's name. The heart, however, is special and is represented by Brandon Burlsworth! Fitting? YES. For no one else could be considered more deserving as the heart of "The Ultimate Razorback" and the heart of the Hogs. Brandon graduated from high school in Harrison and entered the U of A as a walk-on guard for then head coach Danny Ford. He has been described as an "ordinary guy," although, if the truth be known, deep down with the removal of the star ratings and hype, all college football players are "ordinary guys" that just happen to have a talent for playing the game. Brandon was no different. His dedication, persistence, and seeking of perfection in developing his skills, and footwork soon won a starting position for this former walk-on. Whenever he felt that he had not had an especially good practice, he could be found alone after hours working on his footwork until it was perfect for all of the plays that had been used that day during practice. It was this drive and attention to detail that made him the All-American that he became, as well as, the first Razorback football player to obtain both a bachelor and master's degree before completing his Hog playing career. "Former assistant coach Mike Bender summed it all up by saying that Brandon was, 'the best to play the offensive line in Arkansas history,' and added 'there has never been one like Brandon Burlsworth, and there never will be again." To say Brandon was a perfectionist is like saying the sun is a nice place to visit for a quick tan. Everything had to be in its place and everything had to be perfect. He had tremendous focus which made it possible for friends to literally drive him a little crazy by simply shuffling his pencils a few inches on his dorm room desk. During team meetings for five years, he would always sit in the same seat which everyone knew as "Brandon's chair." As the story goes, when Brandon was a junior, an underclassman made the mistake of sitting in "Brandon's chair". With his seat taken, Brandon saw nothing else to do but to quietly stand behind the chair. Being embarrassed, the underclassman soon figured it out and quickly vacated this seat and found himself another more suitable place to sit. Brandon lived in a world of routine and familiarity. He always parked his Subaru in the same spot in "The Pit" just north of the Broyles' Athletic Center. At practice, he would always refuse to remove or unsnap his helmet, even for water breaks. Going to class or anywhere else on campus would find him always walking on the sidewalks and never taking shortcuts across the grass. Being almost OCD and Adrian Monk-like, you could say he always followed a strict regime. Always, always, always ... perfect, perfect, perfect. It could have been his Drew Carey looks with his short hair and black horn-rimmed glasses that dredged up a chuckle in the defensive player across the line from him, but this was soon put to rest by his formidable force and footwork that tended toward perfection. Whether it was a practice or game, Brandon knew only one speed and the defensive player would always suffer the brunt. If you were unlucky enough to line up across from Burlsworth, you would first feel a hit, and in the next moment realize that you were picking yourself up off of the ground. The chuckle would soon vanish and be replaced by a grimace of pain. Anytime the Hogs found themselves inside the twenty on offense, Brandon would quietly challenge the squad during the huddle by asking "OK guys, how bad do you want it?". It was a rally call for commitment from every player to perform at their top level. He very seldom raised his voice, but at this time it would be raised to the highest level that he would allow himself to use. Everything had to be perfect and he truly believed that if it was, then the Hogs would score. Brandon was known, not only for his dedication, drive, and perfection, but most of all for his tremendous faith. Comments from former coaches, and players all express how his strength and trust was brought on by his unyielding Christian faith. There is no doubt by anyone that knew him that he is now at Home. On every occasion possible, Burlsworth would make the familiar trip back to Harrison in order to attend church with his mother. There were many times that after away games, he would pack his bag upon arriving in Fayetteville on Saturday night and make the trip back to Harrison for Sunday morning services. Each time when he would leave to return to Fayetteville, there was a routine that he and his mom would follow where his mom would stand on the porch and say "Watch for old big trucks and pray". In Brandon's world, "Old big trucks" had been the term that he had used for 18-wheelers when he was a small boy. Hearing his mom, he would quietly say "Mom, I love you" and then pull away and head back to Fayetteville and the Hogs. Perhaps it could be found in his origin as a walk-on, perhaps it was coming from a small town environment, or perhaps it was due to his unwavering faith and family upbringing, but no matter what the reason, it had molded Brandon into a unique young man with a complex dual personality. On the field, he had developed into almost the perfect offensive lineman as he went from being a walk-on to being an All-American while becoming one of the elite top-tier players in the nation. The flipside of this was Brandon when he was off of the field. He was the truly humble, gentle giant that never quite realized or took credit for his greatness. At the end of his Hog career, he stopped coach Houston Nutt and his true nature became apparent. Brandon began by saying “Coach, I want to thank you for the best year of my life in football". Followed by Nutt’s response “Brandon, you made it happen". And finally, Brandon ended by saying in his own humble way “No, it was my teammates and coaches. Y'all made it". Any football player faced with his accomplishments and the future that lay ahead might have been totally consumed by his own greatness, but then again, that would not have been “The Burl’s Way”! "Brandon Burlsworth probably represents more good things in this world than I thought existed," - Tommy Tice, Brandon's high school coach at Harrison High School. The Brandon Burlsworth Foundation has been set up by his older brother Marty and the Burlsworth family to fulfill one of Brandon's dreams "that every child is a gift". "The Christian organization's mission is to support the physical and spiritual needs of children, in particular those children who have limited opportunities." Through the Foundation, thousands of eye exams and pairs of glasses have been given to children in need. Brandon's goal had always been to help the under-privileged children. In memory of Brandon and his career, the Foundation has also developed the Burlsworth Trophy which is presented each year to the nation's top college Walk-On football player. While driving a few weeks ago, I heard this song on the radio and found it especially fitting for Brandon as it tells of his faith and love of children. The song this month is one sung by a children's choir containing the powerful words "Lead me on through the night, Take my hand, precious Lord, Lead me Home". For this hawg-tales, I am including an excerpt from the ebook "Hit That Line". "Another great game was played at War Memorial Stadium in 2002 for “The Golden Boot” against No. 18 LSU. Since then it has been known as “the Miracle on Markham,” and has gone down in Razorback lore, as one of the greatest finishes in Hog football history. The game started out like any other football game against LSU. Arkansas was 8–3 at that point in the season. The first half ended at 10–0 with LSU leading. Both teams scored a touchdown in the third quarter which ended with LSU leading 17–7. LSU had their normally tough defense playing its game and had given quarterback Matt Jones fits throughout the game, allowing only 2 completions for 13 attempts passing. Finally, with less than seven minutes left in the game, tailback Fred Talley broke through a seam and ran 56 yards for a touchdown bringing the Hogs to within 3 points at 17–14. Following this, LSU drove down the field culminating the drive with a field goal putting them up by 6 points at 20–14. Time was slipping away for the Hogs. On the ensuing kickoff, Arkansas returned the ball to the Razorback 19-yard line. Once again, it would take a touchdown to win, a field goal doesn’t help. It would take a miracle. Fans had their hands clasped as if in prayer, and the miracle begins. Arkansas was 81 yards away from a win, no timeouts, and 35 seconds left on the game clock. Once again, the Hogs called on Matt Jones’ cool demeanor to lead them to the “promised land.” Jones steps to the line and begins, his all too familiar cadence of calling the signals. The ball is snapped. The final drive begins with a 50-yard pass completion to Richard Smith who had caught the LSU prevent defense out of position. The crowd of 55,000 comes to its feet and goes into a frenzy “calling the Hogs.” Pity the fans that left early to try and beat the crowd for they would miss the last 35 seconds of what was to be the most exciting of the game and of the season. The Hogs were on the move. "Prayers are answered, miracles happen"
The next play is an incomplete pass to Carlos Ousley which stopped the game clock. This is not a bad thing, for it allows the Hogs time to regroup without burning any time off the clock. The Hogs are now on the LSU 31-yard line. Jones, who was known more for his long stride, and elusive running than for his passing ability, comes to the line to take the snap. He takes it, drops back and lets the ball fly into the Little Rock nighttime sky. At the same moment, DeCori Birmingham, running back/flanker, was running down the right sideline toward the southwest corner of the south end zone. With two defenders sandwiching him in, it appeared that the pass would either fall incomplete to the turf or be intercepted. Either case would end the game with LSU claiming the “Golden Boot”. Prayers are answered, miracles happen, Birmingham pulled the ball in making a courageous catch to score the final touchdown with 9 seconds left tying the game at 20 all. Pandemonium sets in. The Razorback bench empties. Taking note of this, the officials threw the flag and instead of having to kick a normal PAT, David Carlton would now be kicking what would be equivalent to a 35-yard field goal. Reality had set in to the crowd who now realized that this was not a normal extra point. It suddenly got silent. When Carlton made contact with the ball, it barely made its way to just inside the left goal post. Arkansas 21, LSU 20. This game had begun like any other game and ended as one for the history books. On that night, the Hog fans in the stadium or listening on radio had experienced a true “Miracle on Markham.” (By the way, Markham is the main street that runs east and west on the north side of War Memorial Stadium in Little Rock.)" Send us your name and e-mail address to receive a FREE copy of the 1960's 45-rpm records in mp3 format to play on your computer, tablet, or smart phone. They make a great gift for any Razorback football history buff. Don't forget to let us know where you are from. WPS! Out of Tennessee in 1946, Arkansas would find a new head football coach - John Henry (“Barnie”) Barnhill. He would coach for four seasons until he was diagnosed with multiple sclerosis. After the diagnosis, he retired from coaching the Hogs to become the full-time “Top Hog” as the athletic director, where he remained until his retirement in 1970. Barnhill who had played guard for the Volunteers (1925–1927), had come to Arkansas after being head coach at his alma mater, the University of Tennessee (1941–1945). While at Tennessee, he led the Volunteers to a record of 32–5–2. A record like this was what the fans were eagerly awaiting. In 1946, the Hogs would win the SWC title and go to the Cotton Bowl Classic where they met LSU. The 9–1 LSU Tigers, led by quarterback Y.A. Tittle were lining up against the 6–3–1 Razorbacks. A crowd estimated at 38,000 faced the cold weather of a wintery New Year’s Day in Dallas in what would become known as the "Ice Bowl". Throughout the game, LSU had amassed a 15–1 advantage on first downs, however the Hogs stiffened in the red zone keeping the Tigers from scoring. On the final two plays of the game, Tittle threw a pass to a streaking Jeff Adams headed for the end zone. At the last second, Clyde Scott tackled Adams at the one-yard line preventing the score. On the next play, with LSU in position to win, a bad snap at the 1 ended the LSU dream of a victory. The game ended in a 0–0 tie. The next season brought another bowl game. The season ended with Arkansas tied for fifth in the SWC with a record of 6–4–1. January 1, saw Arkansas meet the William and Mary Indians in the 1948 Dixie Bowl at Legions Field in Birmingham, Alabama. The game was played before an estimated crowd of 15,000. William and Mary struck first in the initial quarter when Jack Cloud scored on a touchdown run following a fumble recovery. Arkansas had attempted a quick kick, but instead it backfired, resulting with the fumble. Cloud scored again in the second quarter. However, the extra point was missed by Stan Magdziak, the William and Mary quarterback. This would not be the only gift that Magdziak would give the Hogs that day. The Hogs were now down 13–0, but not yet done. While still in the second quarter, Arkansas quarterback Kenny Holland fired a pass to a streaking Ross Pritchard for a 59-yard touchdown. The extra point was good by Aubrey Fowler making the score now a more respectable William and Mary 13, Arkansas 7. Now for Magdziak’s second gift, Hog defender Melvin McGaha intercepted a Magdziak pass and turned it into a 70-yard touchdown run. After a successful PAT by Fowler, Arkansas had finally made a comeback and took a 14–13 lead into halftime. William and Mary came out after halftime and regained the lead once again on a completed pass for a touchdown from Magdziak to Henry Bland. For the third time, the Hogs got a gift from Magdziak when he missed the extra point attempt. After three quarters it was now 19–14, Indians. During the final quarter it would take a touchdown to win the game. A field goal would do no good. With 5 minutes remaining, Leon “Muscles” Campbell would take the ball from the 7-yard line and punch it in for the go-ahead touchdown. Arkansas 21, William and Mary 19. Arkansas wins. Barnhill would have one more season as head coach before his health would force him to give it up. He finished with a record of 22–17–3. Along the way, he had taken the Hogs to two bowl games, winning one and tying the other. ​As Athletic Director, he would later in 1958, be responsible for hiring Frank Broyles as head football coach until his own retirement. If you are one of those rabid Razorback fans interested in knowing even more about the history of the Hog football program, then get your very own copy of "Hit That Line" from the Apple Store, Barnes and Nobles online, or the world's largest e-book publisher - Smashwords.com. This ebook contains most of the items not covered in hawg-tales.com, and focuses totally on the coaches, players, games, "Voices of the Razorbacks", and many other topics within the total history of the program. On November 13, 1999, the Hogs finally got their revenge for the 1998 loss to the #1 Volunteers of Tennessee (see 9/6/2013 hawg-tales). The game was played as a noon game at Donald W. Reynolds Razorback Stadium before a crowd of 52,815 in Fayetteville. The game would place an unranked Razorback team against the #3 Tennessee crowd. But hang on, it's not over until the final gun sounds. It was Nutt's second season, and with players like Cedric Cobbs, Clint Stoerner, Anthony Lucas, along with a full cast of other wild Hogs, the outcome would always be unpredictable. On paper, the stats completely favored Tennessee, but then again that's why you play the game on the field and not with a pad of paper. ​The first quarter began with the Hogs getting the ball on the 20. Three and out would see the Volunteers start out on their 35 and on the second play from scrimmage David Barrett would pick off a Tennessee pass and run it back for the initial score. After the Tony Dodson PAT the scoreboard showed Arkansas 7, Tennessee 0. The kickoff would set up the Volunteers at the Arkansas 26, where they would move the ball in 12 plays and set up a 43 yard field goal by Alex Walls with 7:17 left in the first quarter. The score would remain at 7-3 for the remainder of the quarter. At the beginning of the second quarter, Tennessee would notch their gun by scoring their first touchdown of the contest by a 1 yard run from Jamal Lewis making the score Arkansas 7, Tennessee 10. Following the kickoff Stoerner would lead the Hogs on a 72 yard, 7 play drive that would be capped off by a 6 yard touchdown pass to Joe Dean Davenport, out of Rogers, once again giving the Hogs the lead at 14-10. "With this win, the goalposts came down and Dickson Street got a brand new decoration." With halftime over, Tennessee would get the kickoff and begin on the 20. Six plays later, they would punt the ball back to the Hogs. Four plays later, Stoerner would throw the second interception of the game. With 8:46 left in the quarter, Travis Henry would score on a 28 yard run that would prove to be Tennessee's last touchdown for the day. They would now lead 24-14. After the kickoff with things not looking too good, The Hogs would start from their own 28. Five plays later would find the Razorbacks scoring a touchdown from a 53 yard pass to Boo Williams from Stoerner. We were now only down 24-21. Things were beginning to get exciting with 6:02 left in the quarter. The third quarter would come to an end with a fumble by Tennessee and a punt by the Hogs. ​The final quarter began with Tennessee in possession followed by a punt. Punts would be exchanged until 7:08 left in the game. At this point Stoerner would take command of the outcome. The Hogs would NEVER YIELD. It would be an 80 yard, 8 play drive culminating at 3:44 in a 23 yard pass on second and eight to Anthony Lucas down the left and crossing in the endzone for six. After the PAT, Arkansas once again pulls ahead 28 to 24. Following the kickoff, Tennessee would begin at their own 32. They would drive 51 yards before turning the ball over on downs with only 1:53 left in the game, after which they would not see the ball again. The Hogs would finish the game out ending six straight losses to the Volunteers and becoming bowl eligible. With this win, the goalposts came down and Dickson Street got a brand new decoration. Complete with all of its controversies as to who will fill the positions left open by the departure of a number of very talented players after the 2015 season, the 2016 Razorback football spring practice is now underway. With all of the coaching changes and new players at a variety of positions, fans are excited with anticipation about the upcoming season. But, how did this tradition of a spring practice become an annual event? ​I have not been able to track down the original school where this occurred although the University of Pennsylvania was key in working toward salvaging football. 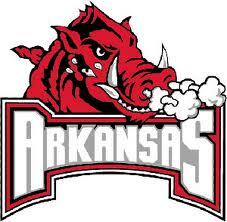 However, it first arrived at Arkansas in the spring of 1910 just after Arkansas' first undefeated season. By this time, college football was in danger of being outlawed and made illegal. If Arkansas was not the first school to have a spring practice, then it was among the first to incorporate this into its program. "It would take the actions of the nation's President to prevent the sport from disappearing into history." By 1906, college football, without any real padding or protection for the players, had become the sport which had turned into a real "kill-the-man-with-the-ball" style of play. By the end of November during the 1905 season, there had been 19 players killed (three of which were hardened college players) and 137 injured while playing the game. National movements were underway to eliminate this form of violence and make football a thing of the past. It would take the actions of the national's President to prevent the sport from disappearing into history. The problem was brought to the forefront of limiting the violent nature of the game after the injury to Theodore Roosevelt, Jr. playing as a freshman and son of President Theodore Roosevelt. Soon after, the elder Roosevelt demanded that rules be implemented to make the game safer and more civil. At first this would be accomplished by regional rule changes incorporated by individual schools. Later this would be accomplished with the establishment of the American (National) Football Rules Committee which became the NCAA in 1910. During this period (end of 1905 to 1910), college football programs were being discontinued at many of the college institutions. However, luckily for us, it was saved from complete extinction. The rules of the game were under fire and if not changed, the entire sport of football was in danger of being no more. By 1910, the Arkansas spring practice was primarily used to familiarize the team with the new rule changes. The 35-minute half was history and replaced by four 15-minute quarters, field goals were reduced from four points to three points. The neutral zone was established, first downs were changed from five to 10 yards, a minimum of six men were required to be on the line of scrimmage, etc. With these changes, the program has been able to progress to where it is now. Not only was head coach Hugo Bezdek responsible for renaming the football squad to the current Razorbacks and coaching the first undefeated team, he would go on to also established the first Arkansas spring practice in order to make sure his players were ready for the upcoming fall season. By the way, the 1910 season had a record of 8-1 while scoring 221 points and allowing only 19 points to be scored by the opponents. Among all of the Cardinal and Razorback quarterbacks, there have been only two to reach the pinnacle of being known as All-Americans. Now these weren't Ryan Mallett, or Tyler Wilson, but quarterbacks from out of the past - Jack Robbins (#43), and Billy Moore (#10). Jack Robbins hailed from Little Rock and played both halfback and quarterback for the Tommy Thomsen led Hogs during the1935-1937 seasons. In 1936, Robbins was selected by the All America Board of Football as the first Razorback quarterback All-American. In 1936, Robbins was only the second Razorback to be awarded All-American status following Wear Schoonover in 1929 (who was the first All-American in the SWC). During the 1936 season. Robbins was also selected as a first-team All-Southwest Conference team member. As a player, he produced 3,253 total offensive yards during his career. His career also produced 198 of 386 passes for 2,553 yards with 19 being touchdowns and 32 interceptions. 1936 also meant that the Hogs would be led by Robbins to a 7-3 finish, a SWC title, and a final ranking of #18 in the nation. With Robbins at the helm, the Hogs became known as the Passing Porkers, the passingest team in the nation. During the 1936 season, Robbins split quarterback duties with Dwight "Paddlefoot" Sloan. Robbins would be used for short passes on dry days, and Sloan for the bomb on wet ones. With All-American end Jim Benton and aided by receiver Ray Hamilton, both Robbins and Sloan were able to pick opponents apart showing their passing skills. Thomsen (known for his passing plays) also utilized Robbins' catching talent as a receiver out of the backfield, although it was his quarterback abilities that won him his All-American status. In 1974, he was inducted into the Arkansas Sports Hall of Fame. Twenty six years later, another signal caller from Little Rock would emerge as the only other Hog to become a quarterback All-American. Out of Little Rock Central High School, Billy Moore would receive his selection as a first team All-American status from the Football Writers Association of America in 1962. During this year, he led the Razorbacks in both running and passing. Maybe his rushing ability had come from his older brother Henry who had been a fullback on the SWC winning 1954 Hog team while leading the Hogs in rushing. Regardless, the younger Moore would rack up 585 yards on 131 rushes, and 51 of 91 completions for 673 yards through the air giving him 1,258 total yards and 19 touchdowns in 1962. 1962 saw the Hogs end up as #2 in the SWC with a final record of 9-2 (losing only to #1 Texas in Austin during the regular season 7-3, and #3 Ole Miss in the Sugar Bowl 17-13). The Razorbacks would end their season nationally at #6 in both the AP and UPI. The loss to Texas came after a four yard touchdown run with 36 seconds left in the game. A win would have put the Hogs in the Cotton Bowl and another SWC title. Oh well! During his three year varsity career, Moore had 25 wins against 8 losses. In 1997, he was inducted into the Arkansas Sports Hall of Fame. He is also a member of the All-Century Team, and the Arkansas All-Decade Team for 1960-1969. Among other things, Moore won both the Houston Post, and Crip Hall Awards for his football skills. If you are one of those rabid Razorback fans interested in knowing even more about the history of the Hog football program, then get your very own copy of "Hit That Line" from the Apple Store, Barnes and Nobles online, or the world's largest e-book publisher - Smashwords.com. This ebook contains most of the items not covered in hawg-tales.com, and focuses totally on the coaches , players, games, "Voices of the Razorbacks", and many other topics within the total history of the program. As foes go, Ole Miss has been one since 1908 where the Cardinals pulled out a win 33-0. Since then the Hogs have held the edge by winning 34, losing 27, while having one tied and one cancelled in 63 games. The only cancellation occurred during the undefeated 1909 Bezdek led season (which would most likely added one more win to the total). In October 1954, Ole Miss coach John Vaught gathered his undefeated No. 5 rated Rebels to meet the Hogs in Little Rock's War Memorial Stadium. During the '50s and '60s, Ole Miss was known as having one of the winningest programs in the nation and on that gameday brought this game into national prominence. The Ole Miss quarterback was a player named Eagle Day who was widely known as the best passer in the nation. But between coach Bowden Wyatt and defensive end Teddy Souter, Day would never get the needed time to make the 40 and 60 yard passes that the Rebels had used as the cornerstone for their season. With 3:50 left in the game, Wyatt called the play that would be the most notable play in Hog football history to that time. The Hogs had advanced the ball from the 17 to the Arkansas 34 yard line. With time running out and the real possibility that Arkansas might not get the ball back again, Wyatt made his famous call. This would be a 66 yard pass play from a direct snap to running back Buddy Bob Benson who launched a 30 yard pass to Preston Carpenter who had lined up as a blocking back prior to the snap who ran untouched for the remaining 36 yards. The Hogs would go on to claim a 6-0 victory over the No. 5 Rebels. The play would later be deemed by Wyatt as the Powder River Pass Play. The 1960 game was once again played at War Memorial Stadium in Little Rock and became a game steeped in controversy. The score was tied seven all when in the final seconds Ole Miss would attempt a game winning field goal. Tommy Bell, who was an official at the game, called an official’s timeout to quiet the Hog fans (imagine that). Ole Miss’ kicker Allen Green didn’t hear the whistle and proceeded to kick the ball splitting the goal posts. GOOD! 10–7, but wait a minute, there was a timeout called before the kick. Ole Miss lined up again. The ball was snapped. This time, in his second attempt after the timeout, the kick by Green was wide. Whether the kick was good or not, and whether Bell signaled it good prior to its going through the uprights has always been controversial. Ole Miss was given the win 10–7. Controversy spread, and fights broke out following the game. Arkansas had been robbed and they knew it. The game for the next year was rescheduled and would be played in Jackson, MS at a neutral field. However, it was 20 years after the Jackson game before the series would be renewed in 1981. Fast forward to 2008. It was then that coach Houston Nutt resigned and made his famous quote "Once a Razorback, always a Razorback" and turned up the next morning being announced as the new Ole Miss head football coach replacing Ed Orgeron. And who will ever forget the "Hunter Henry Heave" that led the Hogs to a 53-52 win last fall in the 4th overtime period. Wow! How 'bout them Hogs. So, as time marches on, the Ole Miss - Arkansas rivalry and controversies are surely going to continue. If you are one of those rabid Razorback fans interested in knowing even more about the history of the Hog football program, then get your very own copy of "Hit That Line" from the Apple Store, Barnes and Nobles online, or the world's largest e-book publisher - Smashwords.com. After winning over the last couple of years, the Arkansas versus LSU matchup can be traced all the way back to 1901. However, on November 13, 1909, the Hogs would register their first win over the LSU squad (1909 and 1964 being the only undefeated seasons for the Hogs). After having lost three of the four previous games (1906 ended in a 6-6 tie), the game displayed a revenge factor and showed the beginnings of a showdown. For some reason, the game was played at a neutral site in Memphis, TN before a crowd estimated at 4,000 which was, by the way, a large gathering at that time. LSU arrived with a record of 4-1 and was favored to win the contest. Although it wasn't a home game, an excited contingent of fans had gathered at the Western Union office located at the train station on Dickson Street. As the game progressed, the halftime stats came over the wires announcing the Cardinals leading by a score of Arkansas 5, LSU 0. Having not been favored, the fans were obviously overjoyed when the final score declared the Cardinals had won 16-0. It was after this game that Hugo Bezdek made his famous speech at the Fayetteville train depot declaring that the team had "fought like a wild bunch of Razorback hogs" leaving the Cardinals behind and ushering in the Razorback era. The years have gone on with LSU maintaining the edge in the won-loss column (Hogs won 22, lost 37 tied 2), although there have been quite a few great games between the two teams. Games like the 1947 Cotton Bowl (informally known as the "Ice Bowl" see 5/6/2012 Hawg-tales) that ended up a 0-0 tie in what was probably the worst conditions ever faced by a Razorback football team. And who can forget the night of November 29, 2002, when Matt Jones would heave his pass to DeCori Birminghame in Little Rock's War Memorial Stadium to beat LSU 21-20. The last drive would see Jones take over with only 35 seconds left on the game clock, no time outs remaining, and 81 yards to go in order to win the game. Razorback football history was made that night as he would miraculously lead the Hogs to one of the greatest finishes that the team has ever had in a game that has become known as the "Miracle on Markham." These, along with many other LSU games, have certainly had their impact on Hog football history. So the "Battle for the Boot" continues each year now as the Hogs meet the LSU Bengal Tigers. I have recently been diagnosed with Prostate Cancer and am presently undergoing radiation treatment. This has left me very fatigued and as a result I have not been able to spend any meaningful time on the computer over the last several weeks. The treatment will be going on until early December and as a result I won't be posting hawg-tales until January. My plan is to post the next one on January 6th. I ask that you please look for it then and not forget the history of the Razorback football program. Thank you for all that you have meant to me and for being true Hog fans. See you in January. WPS!